PHUKET: Phuket Police Chief Pekad Tantipong will transfer out of the province following a nationwide reshuffle of commanders and superintendents released yesterday by Royal Thai Police Headquarters in Bangkok. Maj Gen Tantipong, who took up the Phuket posting in early May 2009, took the Christmas Day surprise in stride. “I have not seen the official order yet, but I heard I will removed from Phuket. I don’t know where I will be working next or when my next assignment will begin,” he told the Phuket Gazette. “I do not have any problem being transferred or working elsewhere. My top priority is to follow orders and I believe my superiors will keep my best interests in mind. I am glad to have been given the opportunity to work in Phuket,” he added. 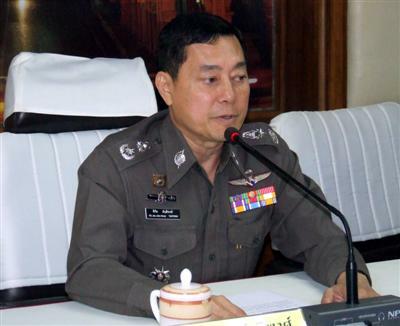 Maj Gen Pekad has had some ups and down during his tenure as Phuket’s top cop. Last year he suffered a dislocated hip in a car accident as he raced to an accident scene. It was later revealed that he was not wearing a seat belt at the time. Then in April of this year his home in Surat Thani was robbed. The thieves got away with items valued at about one million baht, including gold, jewelry and Buddhist amulets. A regular fixture at important provincial events, Maj Gen Pekad in May stepped into a boxing ring with a former Thai champ in a charity bout to raise funds for the families of policemen living in Krabi, Surat Thani and Nakhon Sri Thammarat following floods in March. The Gazette will announce his replacement and other aspects of the reshuffle as soon as information becomes available.